Aspirin Meets Cool New Science! I love the science of medicine. What’s even cooler is when an old drug like Aspirin (which has been written about at least since the time of Hippocrates around 400 B.C.) meets the cutting edge of modern technology. I don’t know. Maybe it just provides some degree of hope for the old fogies like me. Anyway, the smart folks over at PLx Pharma have been teaching this old dog of a drug some new tricks. Aspirin, as we all know, can do a number on our GI tract over time. 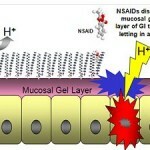 Little by little, aspirin (as well as other NSAIDs) eats away at the mucosa layer that is involved in protecting our stomach lining from the acids produced. This is the GOOD mucus. And when it starts to break down, we are setting ourselves up for pain, ulcers and even life-threatening bleeding events. Seriously. This is bad news. Some estimates suggest that over 16,000 deaths per year are related to GI complications brought about by NSAIDs and aspirin. But here’s the cool science bit. These pharma geeks discovered that a significant amount of GI damage is due to the aspirin molecule “coupling” with phosphatidylcholine (also conveniently known as “PC”). PC helps make up our important mucus layer of stomach protection. When bad Mr. Aspirin enters the stomach he grabs hold of some of the PC in our mucus layer and runs away with it while entering the blood stream. 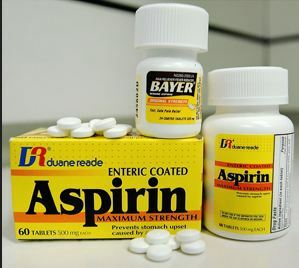 Aspirin is – if you will – a PC magnet. 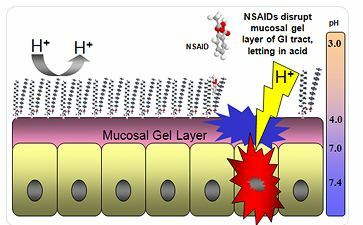 So….these geniuses (I’m serious, this is cool stuff) have produced an aspirin molecule that is ALREADY coupled with PC thus rendering it unable to steal the PC in our mucus layer protecting the stomach. Hence, Mr. Aspirin & Mrs. PC enter our stomach already married, no additional PC needs to be stolen from the mucus, and it enters our blood stream and does what it was meant to do. Pretty cool, huh? I know…kinda nerdy…but it makes perfect sense. And it is apparently more than just a “theoretical” benefit. According to their website, “A completed Phase II clinical trial of PL 2200 demonstrated enhanced GI safety over immediate-release 325 mg aspirin, with a 71% reduced risk of ulcers seen in the PL 2200 treatment group compared with aspirin.” The FDA, by the way, gave these guys their nod of approval in January of this year. Of course, from a marketing and business perspective I cannot tell you whether this new version of aspirin or other NSAIDs is likely to find an investor willing to gamble on it. I can’t imagine the Pfizer’s or Merck’s are really itching to add a “new improved aspirin” to their pipeline. Not to mention that coated aspirin, buffered aspirin & low-dose aspirin all are pretty dirt cheap – and already reduce the risk of GI bleeds somewhat. How much MORE benefit this new Aspirin-PC coupled technology provides will have to be studied. But the science is pretty neat – even if this little idea never matures into a blockbuster. And so, there you go! An old dog like Aspirin learns a new trick from the science guys over at PLx Pharma. Watch their VIDEO on how this new technology works! » OTC Medications » Aspirin Meets Cool New Science!